On Friday evening, April 17th, 2015, Thomas Brown of Thomas Vision Reef, a self-described “aquarium web series” on YouTube, lit up a small corner of the social media landscape with what Brown termed “big news.” Brown told his more than 2000 followers on Facebook that he had been running tests on the top three frozen fish foods used by aquarists to feed their aquarium fishes. The tests were for a video, he said, and in the process of having the tests run, he claims he discovered one of the foods had “high levels of ‘Mercury’!” According to Brown, these elevated levels of mercury may be harming one’s aquarium. Brown concluded his post Friday by expressing his hope that “the company is not aware of this and that they see this post and fix the problem.” Immediately a debate ensued, and, unfortunately, it became one of those debates that almost immediately left data behind at the door. In large part, this is because Brown never presented any data in his post and much of the debate has centered on the data never presented. After looking in depth at the numbers (see below), it seems clear to me that, in all probability, Brown either received incorrect results or misinterpreted the results. The situation, however, is more than a simple mistake or rush to judgment. In fact, in an interesting way, it is not unlike a similar story I covered in the seafood industry–an instance where consumers made choices based predominately on risk, and those choices ultimately proved detrimental to their health because they didn’t understand the data in the face of a proliferation of fear-mongering in the popular (and, yes, social) media. More on that later, but first, let’s look at the data. The story of Brown’s allegations is a story-turned-controversy that should be data-centered. Unfortunately, up until this point, the discussion has not focused on the data. Here’s what we know on-the-record: Brown says he learned of the elevated mercury levels from “a university” where he was having tests run on the three frozen food products. While he initially said he didn’t have “permission” to release the results, he later said on his Facebook page that, according to the test, “[e]stimated mercury levels exceeded 20mg per gram of product.” Citing legal concerns in a video posted to Facebook on Saturday, he did not disclose the name of the testing facility or the brand of fish food in question. In the absence of the actual test results, which as of this writing Brown still declines to release publicly, Brown suggests aquarists send their frozen fish food out for testing. In the interim, his allegations of “high levels of mercury” have created concern and fear amongst aquarists and, according to industry insiders, at least three distributors of frozen fish food. The central questions here should be how much mercury is 20mg per gram of product? Does that concentration of mercury pose a risk to either aquarists or aquarium fishes? Should aquarists be concerned about using this food because of its mercury concentrations, and should the manufacturer, as Brown suggests, “fix the problem”? Mercury is ubiquitous in seafood. The fact that tests of frozen fish food containing marine shellfish and finfish would come back showing concentrations of mercury should not surprise anyone any more than the fact that the seafood for humans found at the local fish monger and in the seafood case at your grocery would also likely test positive for mercury. 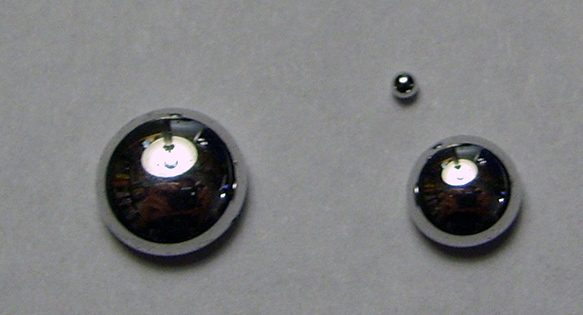 Mercury occurs both naturally and as a byproduct of human activity. Mercury turns into methylmercury in water*, and makes its way into the food web. The higher up the food chain one goes, the more potential there is for methylmercury to bioaccumulate. The longer-lived a fish or shellfish, the more time there is for methylmercury to bioaccumulate. Therefore, long-lived apex predators pose the greatest risk in terms of methylmercury. Sharks, swordfish, and large tuna, for example, have very high levels of mercury in their flesh compared to, say, small sardines. When analyzing the risk posed by methylmercury in seafood, one might be well served to look at the mean mercury concentrations in various types of seafood. ** Because this is a serious human health concern, the FDA tracks mercury levels in commercial fishes and shellfish with a database called “Mercury Levels in Commercial Fish and Shellfish (1990-2010).” While there are some problems with this database that are beyond the scope of this article, these are the “official” numbers most relevant to informing policy and government advice on seafood consumption and food safety. I also mention it here since Brown alluded to “FDA regulations for Human consumption” in his post. Based on the data, the FDA advises women of childbearing age and young children to avoid eating four types of seafood: tilefish from the Gulf of Mexico, shark, swordfish, and King Mackerel. In addition, the FDA is looking at adding Orange Roughy and marlin to the list of seafood that vulnerable populations should avoid. If we look at the top ingredients by volume in the most popular frozen fish foods, we see ingredients like scallop, shrimp, squid, clams, and oysters, as well as various finfishes such as ocean perch, whitefish and, in at least one case, tuna. For the most part, these are seafood products of which the new draft FDA advice on seafood consumption recommends Americans eat more despite the fact that all of them may contain mercury. People who consume fish regularly consistently have lower levels of heart disease and strokes, for example, even though they are taking in mercury every time they sit down to a meal of grilled salmon. Why would the FDA recommend Americans consume more seafood despite the fact that it contains mercury? The answer is simple: Because the health benefits of consuming more seafood greatly outweigh the risk, so long as the consumer is aware of which species may be high in mercury. The sweet spot for humans is those seafood choices that provide the most health benefit and least mercury exposure. In terms of human health benefit, we look first and foremost to Omega-3 fatty acids (Eicosapentaenoic (EPA) and Docosahexaenoic (DHA)), and we find that, according to FDA data, some of the best choice are salmon, anchovies, herring, sardines, Pacific oysters, trout, and Atlantic and Pacific mackerel. In issuing its advice, the FDA directly compares how much mercury is in a four-ounce serving of seafood (mercury micrograms (mcg)/4 oz) to the amount of Omega-3 fatty acids (EPA+DHA mg/4 oz) in that same serving. When it comes to the specific species, the FDA recommends women of childbearing age and young children not eat any of certain species because of mercury concentrations: the data show these species have anywhere from 110 micrograms (mcg) of mercury per four ounces of cooked fish in the case of king mackerel to 219 mcg of mercury per four ounces of cooked fish in Gulf of Mexico tilefish. Brown tells us he has test results where “[e]stimated mercury levels exceeded 20mg per gram” in the frozen fish food. 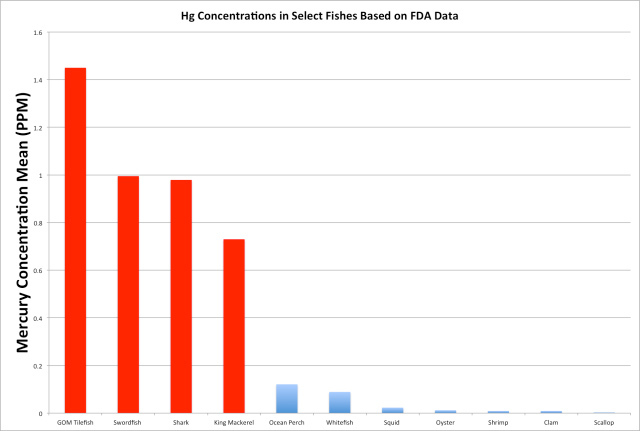 If we do the math, we can compare Brown’s data directly to the FDA’s advice regarding seafood. Brown’s “20 mg per gram” result is equivalent to 2,268,000 mcg/4 oz, which is over 10,000 times greater than the highest mercury concentration cited by the FDA in its advice (Gulf of Mexico tilefish at 219 mcg of mercury per 4 ounces). Put another way, “20 mg per gram” is equal to 2,000 ppm, which is 20,000 times the FDA threshold value. While there are problems with a direct comparison between a fish food and a ready-to-eat serving of seafood (e.g., cooked versus uncooked, total mercury versus methylmercury, dry weight versus wet weight), the margin is so great that anyone looking at that number should sit up and take note. …Which is, of course, exactly what Brown did; but I don’t think he went far enough in terms of his due diligence before publishing a publicly unsubstantiated anecdote that has real-world implications. The most common ingredients by volume in the most popular blended frozen fish foods have nowhere close to the concentration of mercury Brown says was estimated to be in the sample he had tested. Shrimp and clams, for example, have less than 1 microgram of mercury per 4 ounce serving, while oysters have 2, scallops have 8 and squid have 11 micrograms. Even tuna, the ingredient that potentially has the highest mercury concentration depending upon which species it is and where it was harvested, has nowhere close to a high enough concentration of mercury to produce those kinds of results, even if it was the primary ingredient. Given how much of the volume of frozen fish food relatively low-mercury seafood ingredients represent, it’s almost inconceivable that mercury levels could exceed 20mg per gram in the fish food, as Brown says the tests revealed. The seafood used in the fish food is originating from a severely polluted site. The manufacturer is adding mercury to the product. The test results are wrong (or are not being reported accurately). In the case of the first option, since manufacturers of fish food most often source their ingredients from the same supply chains as seafood vendors, Brown’s results would indicate a major human health concern that somehow has escaped detection by local and federal agencies that monitor toxicity. In the case of the second example, one has to ask why a manufacturer would intentionally add mercury to a food product. Adhering to the principle of Occam’s Razor, which says that the option requiring the fewest assumptions is likely the best option, it seems most rational to conclude, given the information we have on-the-record at present, that the test results are simply wrong or are being reported incorrectly. Aquarists, like humans purchasing seafood for human consumption, will want to approach their choice of a fish food to maximize health benefits and minimize risks. Because fishes benefit from Omega-3 fatty acids and can be negatively affected by high concentrations of mercury (just like humans), aquarists will want to choose foods that contain ingredients like the top ingredients by volume in the most popular frozen fish foods–we’re talking scallops, shrimp, oysters, various finfishes and the like. Even though these ingredients contain mercury, generally the health benefits greatly outweigh the risks. What are the risks of feeding our fishes food containing mercury? If one looks at the scientific literature and best available science on how high concentrations of mercury affect fish health, it becomes clear that the issues are not particularly relevant to the majority of aquarium fishes. For example, in the literature, sufficiently high mercury concentrations in wild fish have been shown to affect prey capture efficiency and reduced predator avoidance capabilities, but these are challenges with which aquarium fishes are not frequently confronted. The worst thing aquarists could do for their fishes at this point is respond with fear to a yet publicly unsubstantiated and suspect claim of “high levels of mercury” and use it as a rationale to move away from feeding foods that provide a much healthier diet than many of the other options commonly available. It’s perhaps worth mentioning that we ran into a very similar problem in the seafood world when, in 2004, the FDA released seafood consumption advice that focused on the risks associated with mercury in seafood more than the benefits. While the risks are real, the public’s response, which was largely fueled by the popular media, was heavily slanted toward the risks associated with eating seafood. Rather than deal with the complexities–the exact same complexities I’ve discussed above–the data show Americans instead ate less seafood. The data also show our collective health suffered as a result. If we’ve learned anything here, it should be that we must make choices based on data and the best available science, not anecdote or fear-mongering. So let’s see the data. * In inshore environments, the methylation of mercury–the conversion of inorganic mercury to organic methylmercury–primarily occurs in aquatic sediments via sulfate-reducing bacteria. This methylmercury is passively or actively moved into the water column, where it is bioconcentrated in phytoplankton. Once in the phytoplankton, methylmercury enters both pelagic and benthic food webs via predator-prey interactions. ** Sometimes tracking mean concentrations can be misleading. Wide mercury variations in a fish can equate to a MEAN value being deemed safe, but in reality a relatively high number of individuals could still exceed some threshold level. Great article Ret. Thank you for sharing your wisdom, knowledge and research to provide clarity on this topic. The blood worms and brine shrimp come from china. The major distributors including Sally’s recommend that this food not be used in any fish that would enter the food chain. It is heavy metal toxic and bioaccumulation in your fish could render them to toxic to eat. Pesticides may also be present in excess levels. This is absolutely true and I have the emails to back up my claims and you can call them for yourselves. Bad product. Daphnia is probably ok.
Top notch reporting as usual, Ret. 168g per 6oz= 3.3 grams of mercury. That should have jumped right out to Thomas as a red flag there was an error in the testing. Mercury is normally reported in mg/kg… I think Thomas might have missed that, or it was erroneously reported to him in grams. i agree with you… the numbers dont add up! i think the Uni does not want their name to be known as they know that they %#’%# up ! Very well done Ret. You got the same math calculations as me. You may not of seen this, which is quite interesting on “Shellfish”. You are missing a zero. Twenty mg per gram is equal to 20,000 ppm, which is 20,000 times the FDA threshold value, since the FDA concern is at about 1ppm. Math is a thing I struggle with, so I check constantly, sorry to be so picky. Otherwise, great article! great article ret…at the levels this guy is claiming the food companies he is referring to would have to be purposely adding mercury to their foods….for what reason only mr Brown knows….. This Brown clearly cannot spell, nor do math. Probably confused microgram with milligram. Not even clear the weight of the portion that contained 20 mg.
Unsure whether this length of article was needed to respond to claims by an individual with low literacy levels? Nice article.I did not see any type of apology from Thomas Brown. He came out with such confidence and then he removed all posts from his FB page.You would figure that he could at least admit he was wrong or that his testing was not sufficient. Always love a good argument about seafood. You wrote, " Put another way, “20 mg per gram” is equal to 2,000 ppm, which is 20,000 times the FDA threshold value." You are missing a zero. Twenty mg per gram is equal to 20,000 ppm, which is 20,000 times the FDA threshold value, since the FDA concern is at about 1ppm. Math is a thing I struggle with, so I check constantly, sorry to be so picky. Otherwise, great article! The blood worms and brine shrimp come from china. The major distributors including Sally's recommend that this food not be used in any fish that would enter the food chain. It is heavy metal toxic and bioaccumulation in your fish could render them to toxic to eat. Pesticides may also be present in excess levels. This is absolutely true and I have the emails to back up my claims and you can call them for yourselves. Bad product. Daphnia is probably ok.